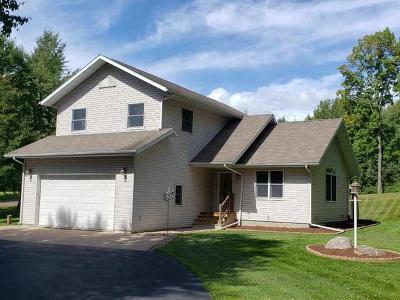 This custom 3 BR 3.5 BA home offers a prime location with over 40 acres of gently rolling, wooded property with trails, and 500+/- feet of meandering frontage on Lake Three, which has no public access. This location offers ATV/snowmobile trail access and is an easy walk to the Lake Ten boat launch/beach. The home has an open feel, Great Room with cathedral tongue and groove ceiling, oak cabinets, 6 panel doors, and a lower level family room and full bath, great for entertaining and/or guests. The upper master suite is spacious, with walk in closet and full bath, and the upper landing doubles as a reading nook/library. There is an attached garage and detached 28 x 36 garage on a slab, plumbed for heat. This lot is landscaped and has sliding doors from the dining area to the rear deck. This property is a one of a kind find. Call for details!